Our biggest issue yet, with more more news and more features! 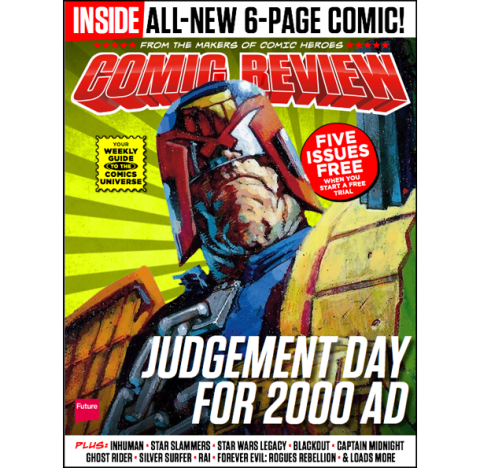 We look at how 2000 AD has managed to survive 37 years and why it’s currently undergoing a renaissance. There’s an interview with Charles Soule about what he has in store for Marvel’s Inhumans (including more Inhumans). There’s another never-seen-before six-page comic strip update of a classic DC Thompson character (and this one’s a doozy). Plus loads of reviews, full of words and things. Some of those words could be Silver Surfer, Forever Evil , Iron Patriot , Bryan Hitch’s Real Heroes , Captain Midnight and Star Wars Legacy . Oh, and possibly aardvark. You never know your luck.